A bit healthier, faff free morning prep! I ate nothing but crap all weekend, and woke up this morning feeling all the worse for it. Sluggish from too much takeaway, tired from insomnia and cold to my bones, I decided that the time was right to bring out the slow cooker and kickstart the week with some healthier eating. 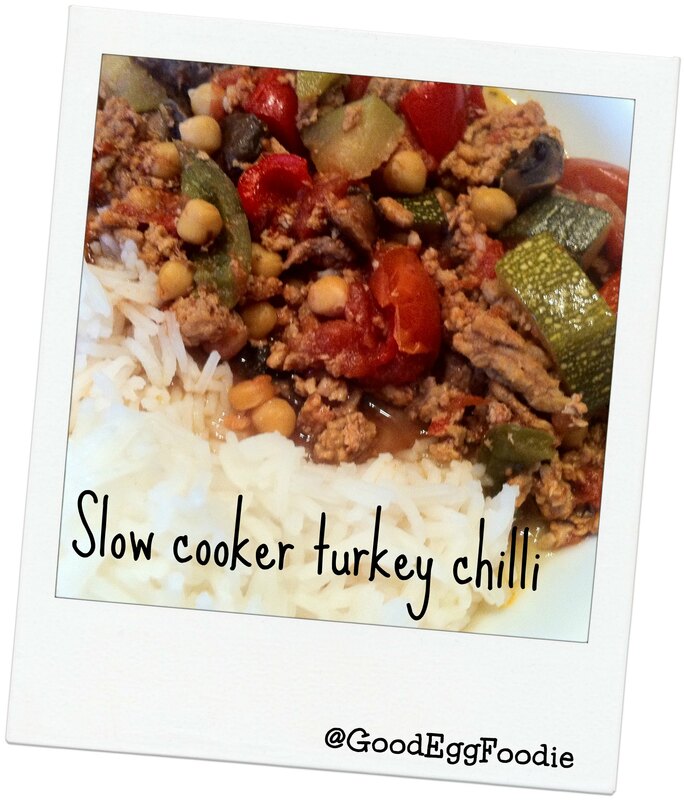 I wanted something tasty, warming but not full of red meat or fat, and really easy, so I decided to do a healthier version of comfort food favourite, chilli. Minced turkey is lower in fat than the traditionally used minced beef and soaked up the flavours you throw at it. Chickpeas add extra fibre and I chucked in as much veg as I could muster up. By putting the veg in raw rather than giving it a quick fry like some slow cooker users prefer, it doesn’t go soggy after seven hours cooking- just soft but still holding it’s shape. I also keep the veg big and chunky to avoid mush. The Wahaca chipotle sauce is a great week-night cheat. Rather than getting all the spices out, you can save time. Great if you are putting this together bleary eyed in the morning when you’re getting ready for work. I also do this with Mr Vikki’s chilli jam for a spicier chilli, but the chipotle gives a subtle, smoky finish. If you think it needs more heat at the end of cooking, just add chilli powder to taste when you come home from work and want to serve up. Oh and I was still half asleep when I made it – I totally forgot onions and garlic! Some people like to brown their mince first. It’s entirely personal choice but I didn’t today as I was in a rush. At this point you are going to look at the mix and thing ‘mmm, looks a bit dry. I’ll add some water/more tomato. Nooo! Trust me, this ends up as quite a soupy mix so fight the urge. I served this with a pile of white rice for the hubby (two spoons of it for me), some home made guacamole and a dollop of 0% Chobani in lieu of sour cream (and actually far tastier) for me…and of course a few tortilla chips. I might be having a healthier day but I’m not dead! There was supposed to be tasty cheese crumbled on top of the hubbys, but I forgot that too. Mondays eh! Will be having leftover for lunch tomorrow when they will be even tastier for having the flavours soak in overnight.